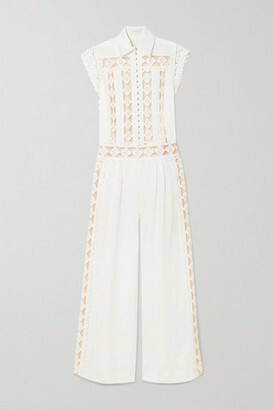 Zimmermann's 'Cascade' jumpsuit is artfully ruffled along the plunging V-neckline and lace-up back. It's cut from wispy silk-georgette and printed with this season's polka-dots in fresh white against a charcoal base. The relaxed, wide-leg silhouette is balanced by a nipped-in waist - try swapping the accompanying tie for your own belt or scarf to really show it off.